When most folks picture Boston, they think of Puritans and patriots (and the Red Sox! ), of minutemen and Paul Revere and tea parties. But many overlook the time when Boston last took the nation by storm—not in the days leading up to the American Revolution, but during the Civil War. Although no battles were fought near the city, Boston was the center of some of the most viral protests against slavery and a hotbed of unbridled support for the Union cause. 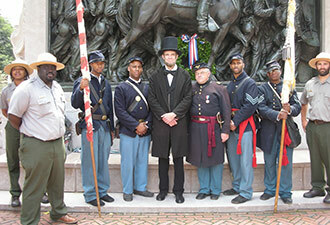 Civil War history appears in the city in memorials and buildings that once shook with passionate voices. Boston African American National Historic Site, the largest area of pre-Civil War black-owned homes, churches, and businesses in the country, will reveal these places to you. The first Africans arrived in Boston as slaves in February of 1638, eight years after the town was founded. By the end of the American Revolution, though, there were more free black people in Boston than slaves. When the first federal census was completed in 1790, Massachusetts was the only state in the Union to record no slaves. A large community of free, literate African Americans began to flourish in Boston, particularly on the north slope of Beacon Hill. Here you will find the structures associated with Boston African American National Historic Site, the Museum of African American History, and the Black Heritage Trail®, which begins at the Robert Gould Shaw Memorial (known as “Boston’s conscience”) and ends at the African Meeting House. 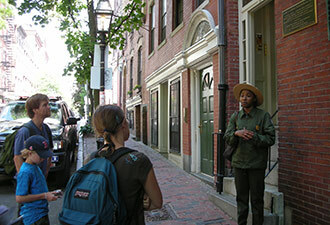 Join a ranger on a journey through Boston and into our nation’s history. Dedicated in 1897, Augustus Saint-Gaudens’s memorial to Robert Gould Shaw and the Fifty-fourth Massachusetts Regiment is often lauded as the greatest monument of the Civil War. Using 40 African American men as models, Saint-Gaudens created some of the first non-stereotypical images of blacks in American sculpture. The trail leads past the Abiel Smith School, today’s home of the Museum of African American History, New England’s largest museum dedicated to preserving and sharing the contributions of African Americans. At the end of the trail stands the African Meeting House, the oldest existing black church building in the United States, which dates to 1806. The building’s basement served as a meeting place and school, while the main sanctuary witnessed speeches by Frederick Douglass and the establishment of the New England Anti-Slavery Society by William Lloyd Garrison. Homes of abolitionists—places where fugitives were welcomed and protected—form highlights on the trail. 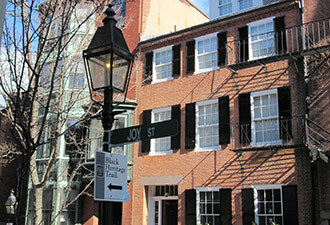 At 66 Phillips Street, for example, Lewis Hayden, himself an escaped slave, turned his home into a safe house for runaways after the passage of the Fugitive Slave Act in 1850. While hiding runaways in their basement, Hayden and his wife, Harriet, kept two gunpowder kegs under their front stoop. Once, when bounty hunters arrived, the Haydens came out holding lit candles and threatened to drop the flames and detonate their house, themselves, and their visitors rather than turn over their hidden guests. To experience the Black Heritage Trail® with a National Park Service ranger as your guide, please call the park at (617) 742-5415 24 hours before your arrival to reserve your spot. From Labor Day through Memorial Day (winter season), tours are offered Monday-Saturday at 2 p.m. From Memorial Day through Labor Day (summer season), tours are offered Monday-Saturday at 10 a.m., noon, and 2 p.m.